Last week, the New York Times published an article called "Banish Winter with the Taste of Spring", characterizing the locavore's springtime dilemma. Come the first sign of warm weather, New Yorkers whet their appetites for the season's namesake veggies; peas, asparagus, and artichokes are a few greener favorites that immediately conjure up cravings for the fresher, brighter meals of Spring. But trek to the Greenmarket, and only winter's meager leftovers can be found: potatoes, a few stray root vegetables, apples. We're still a month away before local fresh produce catches up to our lightened appetites. So, what is the Springtime locavore to do? Author David Tanis offers two options: first, mimic spring by cooking with fresh herbs and focusing on brothy soups and green foods; and second, cheat! While eating local is important, these vegetables are available at the supermarket via crops in places where the season has already arrived. Salivating for Spring big-time, I followed both pieces of Tanis's advice and created this Cod and Spring Vegetables en Papillote. En papillote? Sounds fancy. And while this dish certainly delivers impressive sophistication in both presentation and taste, the preparation is super easy—and clean-up zilch! This dish is like a present: the fish and veggies are wrapped up "en papillote" (aka in paper/parchment), then baked in their own juices until succulent and tender—your only job is to place it in the oven. Less than 30 minutes later, voila! Unwrapping the paper reveals dinner steamed to perfection, surrounded by a fragrant, flavorful broth that begs for a crusty baguette or bed of whole grains for sopping up. Oh, and that "clean-up" I was talking about? Since the dish only touched the paper it was encased in, crumple it up and throw it in the garbage—your pan stays spanking clean. The vegetables and herbs that go en papillote are for you to choose. I threw in grape tomatoes, zucchini, capers, and artichokes; but was also considering asparagus, peas, leeks, and yellow squash. Anything will taste good in the lovely, light broth of chicken stock, white wine, and fresh lemon juice. For herbs I chose cilantro, but parsley, mint, and basil will work well too. Throw in a fresh sprig of thyme or oregano to really hone in that garden-fresh Springtime flavor. The diced jalapeño contributes a spicy kick to contrast nicely against the broth's mellow flavors. 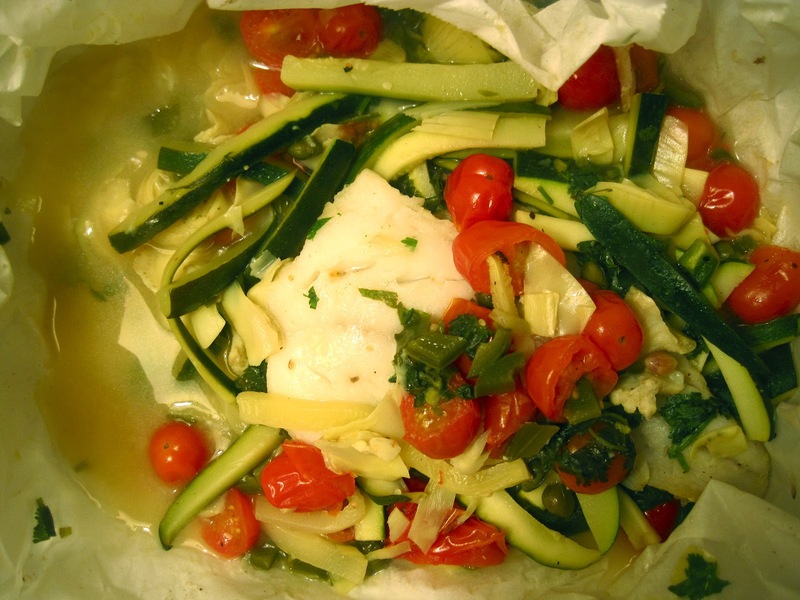 This Cod and Spring Vegetables en Papillote can be prepared with frozen or fresh fish. I chose cod because it is mild in taste, reasonably priced, and generally sustainable (most atlantic cod in the US is imported from Iceland and the northeast Arctic, where fisheries are well-managed and the cod population increasing.) If you can, choose hook-and-line caught cod: it is Monterey Bay Aquarium's "best choice" thanks to low levels of bycatch and habitat damage. Serve with a light white wine, fresh green salad, and sop-friendly grain of your choice (brown rice, cous-cous, and quinoa are all good options.) And as you throw out that parchment paper, say a final goodbye to the hearty stews and thick leafy greens of winter: Spring is here! 2. Center the papillote in the baking pan, and crease firmly around the inside edges to line it. (There should be ample paper hanging off each side.) Lightly mist the surface with an olive oil spritzer (or 1 tbsp olive oil.) Add cod filets to pan, sprinkle with salt & pepper, and flip over. Set cod fillets aside. 3. Add the grape tomatoes, zucchini, scallion, jalapeño, capers, and artichokes to the papillote. Mix vegetables together. Place the cod fillets over the vegetables. Sprinkle cilantro (and other desired herbs) evenly over fish and veggies. Pour chicken broth, white wine, and lemon juice evenly over the contents of the papillote. Fold the excess paper over the fish mixture, just like closing a box, so contents are completely sealed. 4. Bake for 30 minutes if fish is frozen, and 15 minutes if fish is thawed. Season with more salt & pepper to taste. Serve over rice, cous-cous, quinoa, or pasta; or with whole-grain sliced baguette. Pour excess broth over fish upon serving.